Andrew is the featured artist at the Laity Lodge’s Retreat for Ministers to Artists. Andrew will be sharing his story and performing a few special duo pieces with Max ZT. 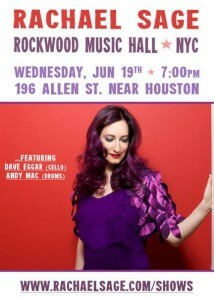 June 19th – Rachael Sage at Rockwood. After an amazing weekend of music, I get to return to Rockwood Music Hall (Stage 1) with another amazing artist: Rachael Sage. Another night of music, another FREE show, hoping to see you there!! !